LONDON, England -- England fans arrested at Euro 2012 face getting locked up in “drunk tanks” and detention centres notorious for police brutality. Overcrowded, disease-ridden cells await unruly supporters at the football tournament – and some face being stripped naked, hosed down with icy water and strapped to beds. In Ukraine, which will host England’s three group matches, a study has revealed numerous suspicious deaths in police ­custody and reports of vicious beatings and extortion. 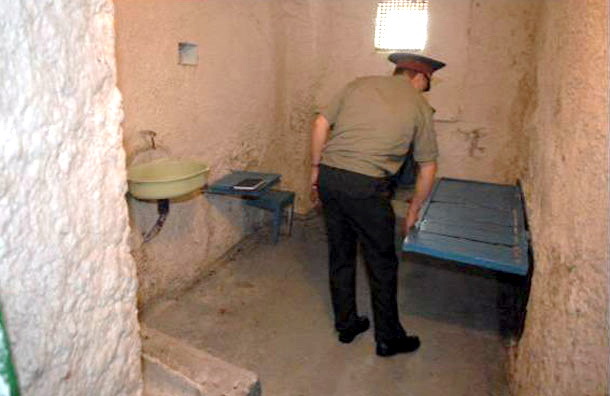 The Sunday Mirror’s exclusive pictures show the shocking ­conditions inside cells in Ukraine and fellow host country Poland. They are a stark warning to the tens of thousands ­expected to travel to the championships in June. In Kiev, where England play Sweden on June 15, cells are run by brutal guards and lack hot water, leading to a number of cases of tuberculosis. Built in 1863, the crumbling cells of the Lukyanivska centre have seen little modernisation in more than 140 years. And fans heading to Krakow in Poland and the England squad’s headquarters face landing up in a drunk tank for 24 hours if police find them on the streets drunk... with a £80 ($125) ­“release fee” on top. In Donetsk, where England play France and Ukraine, the ­detention centre is equal to that in Kiev for disease and ­brutality. For years ­human rights groups have been ­demanding change in both countries, and in particular an end to ­increasing levels of police violence in Ukraine. A report by ­Amnesty International in October shows ­suspicious deaths in police custody there rose from 21 in 2009 to 50 in 2010. And the study warns foreigners that racism in the former Communist force is “part of police culture”. Ukraine’s deputy prime minister Borys Kolesnikov has tried to assure fans they will be safe, saying: “I’m ­absolutely sure police ­officers will not abuse their ­authority. But his words come ­after a probe into police who bludgeoned a student to death in cells last year. And a poll ­carried out in May by the Kharkiv Institute of Social Researches found that 23 per cent of Ukrainian policemen admitted using violence as one of their main methods for getting a confession. The England team will be based in Poland, even though their first three games will be played in Ukraine. The team’s black players including left-back Ashley Cole have often suffered racism when England play abroad. Fans planning to stay close to the squad’s HQ in Krakow have been warned by the Foreign and Commonwealth Office that “police take a strict approach to public drunkenness... and you may be taken to a drying-out clinic where a doctor or nurse will medically assess you”. But the “medical assistance” is so poor six people have died this year while in drunk tanks and the Helsinki Human Rights ­Foundation is calling for them to be abolished. Expat Briton Greg Watson, 32, who lives in Warsaw, was strapped to a drunk tank bed after he was arrested for walking home drunk from a party. He said: “It was the most ­horrifying experience I’ve ever had. ­Because I couldn’t speak the language they at first ignored me. But Polish police are standing firm.